A Southern Grace: have faith, young grasshopper! Have you ever gotten halfway through a recipe only to take a look at what you've done and question if it's even worth continuing? Sometimes my batter or dough looks so peculiar and unexpected that I begin to doubt a)the reliability of the recipe and b)my execution of said recipe (usually in that order--surely it couldn't be a mistake on my part...). This was one of those instances. I very nearly took my mixed batter and transferred it directly to the trash can. Thankfully, wasting things goes against every fiber of my being, so I pressed on. Here's the short story: I've made lots of muffins, and the batter is almost always pourable or, at the very least, easily spoonable. What I ended up working with here was more reminiscent of cookie dough, which certainly gave me pause. It was so thick that there wasn't even a glimmer of hope that it would spread out nicely in the muffin cup. Regardless, I spread the sticky stuff out as much as I could and tried my best to mask the inevitable hideousness with blackberries and cinnamon-sugar. I then popped the tray into the oven and walked away, fully expecting to see ugly little mounds of cooked gunk upon my return. Well, whaddya know, there's a happy ending to this story--everything worked out splendidly. The batter puffed and baked beautifully, resulting in something very similar in smell, taste, and texture to your typical bakery-style blueberry muffin. Preheat oven to 350F. Line muffin tins with papers or appropriately grease. In a small bowl, combine topping ingredients and set aside. In a larger bowl, cream together the butter, sugar, and eggs. Beat in the yogurt and vanilla. Add the flour, baking powder, baking soda, salt, and cinnamon; stir until combined. Spoon and scrape the batter into the prepared cups. Push the stiff stuff down with blackberries and liberally sprinkle the tops with the cinnamon-sugar. Bake for 15-20 minutes for mini-muffins and about 25 minutes for regular muffins, or until toothpick inserted into center of cake comes out clean. Glad they turned out well. I know I've had instances like that too. I've always felt I had nothing to lose. Sometimes I've been burned, sometimes things turn out. You live you learn! I will have to give these a try. I have a bunch of yogurt leftover from last week's tzatziki. Thanks for posting! Glad they turned out well after all. This sounds like a great recipe to try. I love your titles. I went blueberry picking with the kidlets yesterday, so we have a fridge full begging to be used. This looks like a great recipe! Thats happened to me before with muffins too. But with mine, they never actually rose. Thats why I tend to stay away from baking! I always end up doing something wrong! That happens to be a lot & like you I usually continue on though usually not with success. 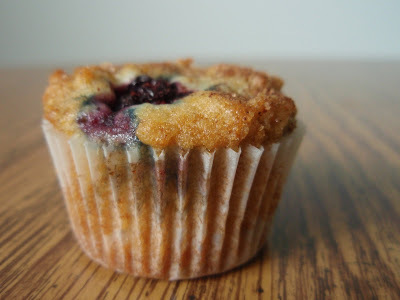 i love berry muffins - especially topped with cinnamon and brown sugar! perfect for breakfast; when i have some ready, waking up doesn't seem like such a chore! Oh yeah, I do that...it's like...what's going on in this bowl? Glad it all came out. That sounds like some thick batter! I am so glad you kept going because they look AMAZING. I have had many instances like that...like the time I was out of all purpose and used bread flour for cinnamon rolls...I had to use double the recipe and they looked, well, not pretty, but they came out alright! And I'll never make that mistake again. This recipe sounds exceptional. I have to try it. I can add some of the enormous local blueberries I bought at the farmers' market yesterday. Yum! I love the name of these muffins and they really look gloriously wonderful!! I'm so pleased you went with it and all turned out well!! Blueberries and cinnamon are one of my favorite combos!! So tasty. They came out perfectly. I usually try to make the batter look or act like what I think it should. It's not always pretty. Glad this worked out for you, because these muffins look great! The muffins look really tasty! Blueberries and cinnamon...to die for! Oh, ye of little faith....those look lovely! Thanks goodness you refrained from ditching the batter! Nice post & pictures. 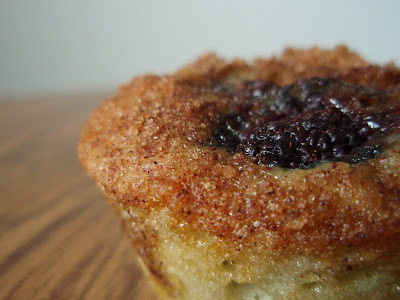 Gotta love George Michael coming together with blueberry muffins in a blog post. Interesting. I'm glad you proceeded with the muffins because they look great! The brown sugar cinnamon topping looks pretty terrific too. Maybe the thickness would help the blueberries stay where they are instead of falling to the bottom. I think I need to try this recipe when I pick my blueberries. It looks really good Grace and I am so glad you pressed on despite your reservations. Good job cinnamon grasshopper! your muffins turned out beautiful! Blueberries & cinnamon, such a great combo. Looks terrific. I say these muffins look perfectly yummy- glad it wasn't a flop like you feared! 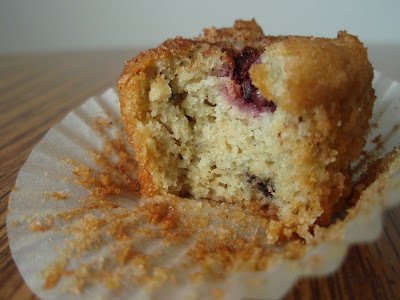 I have a blueberry muffin recipe where the batter is real thick, but it comes out just fine! Aaah, so glad it worked out. they look so moist and delish! They look simply perfect Miss Grace, you always have the best things at your house. I have never seen batter that thick! I am glad you pressed on and that they turned out so nicely! blueberry oikos in a blueberry muffin- omg that's amazing! i've been craving blueberry muffins for ages... this is the recipe I'm using... can't wait! Awesome! I love how you describe sticking-it-out, even with low expectations. Sometimes you just have to continue on your decided-upon path and things just work out! It certainly looks good. Glad it worked out. I hate when you "doubt" as you go along. I hate it even more when my fears come to life! LOL. I LOVE the title of these! I probably would have done the same thing. Glad it turned out so well!! You're a trooper! Thanks for the heads up. Sometimes it's the most unsuspecting consistencies that produce the best final product. These look delectable! We loved Fringe but sadly I could tell they had had to cut one ep (I thought the Harris plotline, the boss who was a traitor, was very rushed and thin at the end) but I forgive them since it was n not their call and so well executed otherwise. Great ending twist! It's my first time here on your blog and i'm lovin' the photos and the food!!! Usually when my batter or dough is looking odd I decide it's time to read the recipe properly... maybe I'm doing this whole 'baking thing' in the wrong order. I love your 'when in doubt, add cinnamon sugar' approach. The world could learn from you XD. Cookie dough in muffin form sounds divine...I might have to work on that! I'm glad you didn't give up on these - they look wonderful. Your berry muffins do look georgous! All ofhtat and they STILL turned out delicious! Would never have guessed this started out looking like cookie dough batter. If anything, that means it's less messy to make right? Glad they turned out, they certainly look delicious! I love the Greek yogurt in them! Some of my best dishes have been ones I swore up and down would not come together. Then there is that whole moment of holy crap this actually came together!! Of course then on the flip side some of my worst dishes were ones I thought there was no way it could get screwed up. This is certainly a success! They look yummy, Grace! And what a clever idea to use blueberry-flavored yogurt! Talk about faith! They look wonderful - I'm glad you persevered. Mmm nothing wrong with those muffins! I love that you used yogurt. And covered them in cinnamon sugar mmm. Some of my muffin batters are pretty thick sometimes. More often than not they're on the thicker side but not usually as thick as cookie dough. oh my! Those muffins look too good! I will definitely try it. Thanks for sharing! And then there is that cinnamon sugar which is sort of like when you pull a save by adding bacon to something savory, right? These sound fab to me -- especially the texture.